The Turkish language reform of 1928, ended a more than 600 years history of writing the Ottoman Turkish language in an adapted form of the cursive Arabic script and introduced a new Turkish writing system based on Latin letters. At this point, Turkey was in danger of losing touch with a centuries old literary, historical, and cultural tradition. In response, Turkish scholars undertook the daunting task of converting a vast corpus of precious texts and documents written in the Arabic/Ottoman script into Latin letter transcription alphabet versions as soon as possible. For nearly 100 years transcription has been a core project of scholars studying Ottoman literary, historical, and cultural texts. The urgency of the cultural preservation project meant that the process of creating Latin letter editions from large, widely dispersed groups of manuscript copies most often skipped essential steps such as creating foundational editions in the Arabic script and examining representative samples of manuscript copies of a text. As a result, significant features of the original texts were lost, for example, the spelling in Arabic script of Turkish words and significant rhetorical embellishments dependent on the visual characteristics of the Arabic script. With the advent of digital technologies and tools, it has become possible for researchers to accomplish transcription and editing tasks that would have been prohibitively time-consuming and expensive only a few decades ago. 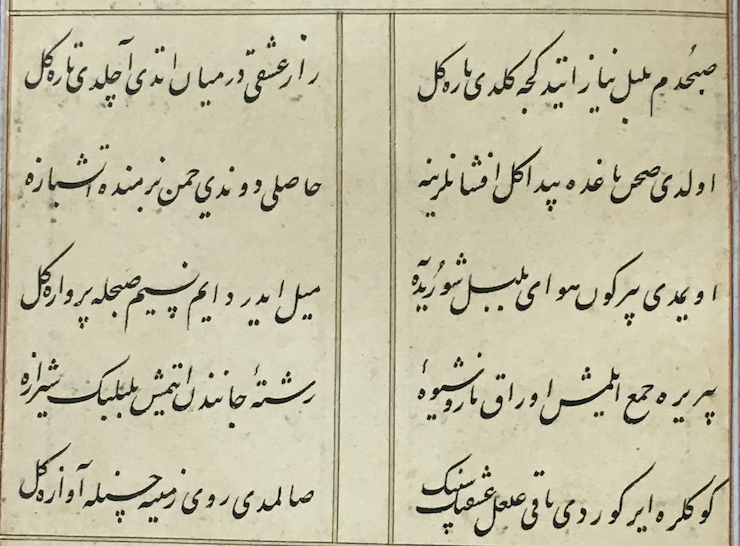 One such tool is Scribe, a digital transcription tool created by researchers from the University of Washington Informatics School, aided by Turkish transcription experts and Ottomanist scholars. The Baki Project’s Scribe tool creates a digital text which eliminates the gap between the Arabic script original and the Latin letter transcription by associating every Latin letter directly with an Arabic script equivalent. The result is a Latin letter transcription that produces, from the same source, a digital transcription in the Arabic script. This means that no gap exists between the Latin letter and Arabic script transcriptions and that any Latin letter input must produce Arabic script output that is directly comparable to the original text. Any input that does not produce comparable Arabic script output is obviously in error. The current tool displays, from left to right: 1) a box for a standardized Latin letter Ottoman transcription alphabet input, 2) an image viewer where one can load a digital image of the original manuscript, 3) a box where the Arabic script output appears automatically as the user enters letters in the Latin transcription box. When a Latin letter is entered on the left, a list of options for Arabic output may appear in a dropdown box from which the transcriber can pick the option that represents what appears in the original manuscript. The tool is a work in progress and further versions will focus on refining the options and building collaborative features of the tool, such as authentication, a project management system, and integration with a manuscript database. View or download instructions for use here.